The Witches Brew Tea and Coffee House looks like the salon of an old Victorian manor. The seating is all reproduction Victorian in varying shades of ivory and red. There are several sections where trios of arm chairs, or a sofa with two arm chairs have been set out around coffee tables, lending to a more 'homey' feel. Of course, there are also more traditional seatings of small round marble and wood dining tables surrounded by four armless side chairs. Atop the center of each table is a trio of varied height flameless candles. 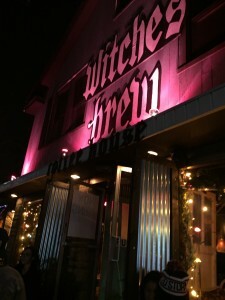 The lighting in Witches Brew is kept dim, but bright enough to peruse a menu easily. Pink twinkle lights adorn the walls, outlining the random mirrors that have been placed about. Dark velvety curtains and valances hang over the windows.